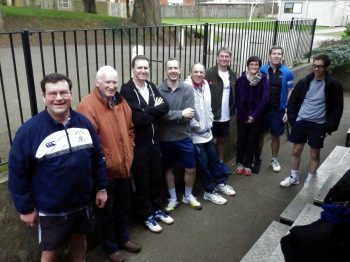 In late February, the OW Fives Club enjoyed its annual tour to the West Country, with a fine combination of Fives, socialising, plentiful eating and drinking, and 6-Nations rugby viewing! Matches were played in Sherborne and Tiverton, securing victory against the former, but suffering a loss against a strong team at the latter (shown in photo at Tiverton’s courts, OW tourists Robert Dalman (1972-79), Ed Andrews (1963-70), Graham Norman (1975-83), Nick Woolfenden (1986-94), and to the right of Tiverton opposition, Jonathan Higgins (1986-94)). For any readers familiar with Sherborne, you’ll be pleased to hear good advantage was taken of the Digby Tap’s plentiful, varied and inexpensive beers! At the time of writing, our Club AGM is soon approaching – the first since the untimely death of OW Fives Club president Richard Hunt OW (1953-61), and we will raise a glass or two in his name that evening. We also hope to have a few more matches in an ‘extended’ (belated!) season. And last but not least, congratulations to Tony Hamilton OW (1963-69) who – and we are assured this is no April fool! – on 1st April (with partner Spencer Beale from Eastbourne College) became national Fives Masters doubles champion. Well done Tony. We play Fives socially at the school courts most Thursday evenings and occasional Sunday mornings. Contact nickwoolfenden@hotmail.com for information about playing with the Club.